The MET COSTA MESA WINS 2018 RENOVATED BUILDING CATEGORY! http://www.mccarthycook.com/wp-content/uploads/1-03-7.jpg 1334 2000 bmmmcc http://mcc.pixelatedarts.net/wp-content/uploads/McC_Logo.png bmmmcc2018-12-18 13:11:192018-12-18 13:15:34The MET COSTA MESA WINS 2018 RENOVATED BUILDING CATEGORY! 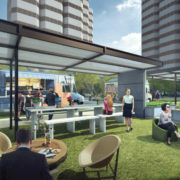 While the SanTana City Council is trying to ban taco trucks (#carneasadaisnotacrime), the city of Costa Mesa is welcoming Orange County’s first permanent food truck park at The MET, a vertical creative campus consisting of three 12-story office towers and a three-story 24 Hour Fitness Sport facility. “We are looking to provide a daily diverse, and vibrant culinary experience doe tenants and visitors with the ‘Food Truck Runway’ here at The MET”, says owner and manager, McCarthy Cook & Co. They have hired Karen DiEugenio, a luxe lonchera Bacon Mania to curate the daily truck rotation as well as operate Verde Kitchen, the new on-site café lounge that will compliment the selection of food trucks on campus. DiEugenio looks to assure that there will be a variety of trucks from Orange County (as well as possibly hosting visiting trucks from LA and IE) along with organizing special events like farmer’s/artisan markets, concerts, movies, and tap takeovers to create an exciting experience for tenants as well as visitors to the campus. 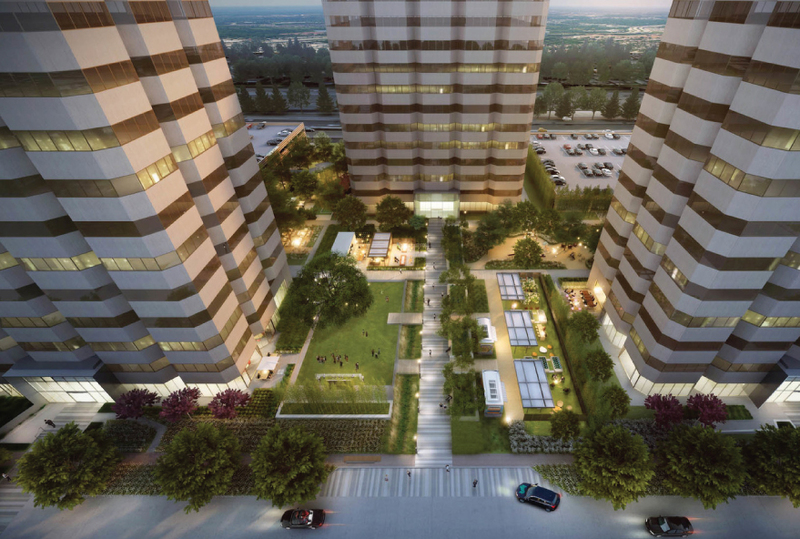 Connected to the Runway will be three comfortable seating and social areas offering a shaded outdoor dining retreat for tenants and visitors. Each seating area will also feature urban planter beds with fresh vegetable and herb gardens growing produce for Verde Kitchen to be offered in their daily select “Farm to Fork” menu items. There will be permanent bays for three food trucks, one of those spots each day will be occupied by a resident food truck and the remaining two spots each day will be filled on a rotating basis from a pool of food trucks like Hobo Pizza, White Rabbit, Piaggo on Wheels, SOHO Taco, Dogzilla and many more. The whole community is encouraged to visit the Food Truck Runway and enjoy all that the campus at the MET has to offer. Parking is available for outside guests (a 15-minute grace period), and the new Verde Kitchen will validate parking for café and food truck visitors. The expansive 15-acre campus along the 405 freeway is slated for a grand opening in Summer 2017. In the meantime visitors are welcome to visit and grab a bit from the rotating collection of trucks serving lunch daily from 11 a.m. – 2p.m. See you there! Q What are the biggest public affairs challenges architects face from proposed and existing state and federal laws, regulations and recent court rulings? How does AIACC propose they be resolved? A Keeping up with the ever shifting landscape of regulation and legislation is a challenge for California architects. We are fortunate at the AIACC to have a very experienced staff in Paul Welsh, our exec director and Mark Christian and Kurt Cooknick Assoc. AIA, bolstered by our consultants. They work in concert to keep AIACC leadership in the loop. This year there have been a few “shooting comets” that got a lot of attention only to have since dropped to the background-one example was the proposed sales tax on services. This was a proposal which would have had major negative impacts on the com-petitiveness and service model for all California architects, and major fallout for citizens and institutions statewide as a result. We are quick to move when new proposals come to light; we take a “big picture” view in analyz-ing the impacts not just for our profession, but on citizens, the environment, on business and on sustainability. We use that lens to craft positions that we believe in most cases become the prudent course that prevails. We con-sider this work part of our calling to be “stewards” of the built environment. Having founded a local program over a decade ago called “code conversations” has helped build an environment of trust and communication with region-al code officials. That open channel brought some serious dividends for both sides of the counter, to focus on common ground: a shared interest in high-performing buildings that com-ply with modern design standards: life safety codes, energy-efficiency goals, and sustainability objectives. For a small task force of local architects and code officials, the “win win” result after rolling up our sleeves for about six months: the PASS Program (Prequalified Architectural Submittal System). PASS increases efficiency and effectiveness of the plan review process, with minimal change to normal business practices of design professionals, with the result that citizens enjoy high performing modem buildings quicker, with lower cost, and increased public safety and code conformance. PASS boosts economic development, at little to no cost. It’s not surprising given the win-win foundation of PASS as an innovative approach to the regulatory process that is already in use by 16 jurisdictions including the City of Sacramento, Folsom, Elk Grove, the County of Sacramento and more -the first such regionally consistent program in the country. A companion program “One and Done,” which eliminates wasteful and costly excessive plan review cycles, is in beta test now. Repurposing older buildings via design and construction retrofits can be much greener and less costly. Making the right calculation is complicated, it must be assessed on a project-by-project basis, and there is disagreement about the entire process. But, given the fact that the overwhelming majority of all commercial stock already exists and comparatively few new buildings are erected each year, repositioning or retrofitting makes sense if the structure fits the tenant’s needs. In planning and budgeting, owners should ask if energy and environmental upgrades are financially feasible, compared to those planned in new construction. What are the government codes considerations? How long will it take to gain government approvals for a new facility, raze it and construct it-and how much money will be lost in the meantime when less time-consuming retrofits can be achieved? Retrofitting can significantly reduce costs, but is the older building’s structure sound and appropriate for longer-term uses? course of a 75-year life span. 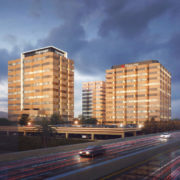 LCA is an internationally recognized approach to evaluating the potential environ-mental and human health impacts associated with products and services throughout their respective life cycles .” The study was published by the National Trust for Historic Preservation and The Summit Foundation, with the sup-port of companies like the Skanska Group. Brenden McEneaney, director of the U.S. Green Building Council Northern California, says , “A lot of energy and embodied carbon goes into building materials. As new buildings us e energy more efficiently, an increasing part of a building’s environmental impact is embedded in all the materials required to build it. To reduce that impact, retrofitting old inefficient buildings can make a lot of sense. The Empire State Building avoided the cos t of a new chiller by investing in efficiency. Older buildings often were designed with sustainability, using natural day-light and ventilation, and are often located near trans it. In Silicon Valley, Sharp Development has retrofitted office equipment. Energy savings of 50-75% can be achieved in commercial buildings that makes mart us e of energy-efficiency measures, says IPCC. But is Retrofitting a Good Investment? The historic Western Metal Supply Building incorporated into the design of Petco Park in San Diego (front and back views). Photos courtesy of Heritage Architecture & Planning. 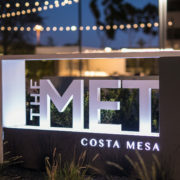 McCarthy Cook SVP Brian Harnetiaux, this year’s chairman of BOMA International, says his company is “currently is repositioning a fifteen-acre campus in Costa Mesa that will be rebranded The MET Costa Mesa. (See rendering above.) New commercial buildings are being constructed in this market, but rather than tear down three perfectly good office buildings, we decided to update the campus and add new amenities in order to remain competitive and attract the best tenants. That said, new buildings experienced higher occupancy (6.4% versus 2.5%) and higher rents (6.1% versus 1%). There is, however, no question that retrofitting older buildings with energy and lighting upgrades is invariably a good investment. For instance, ENERGY STAR-certified buildings have 13.5% greater value than those whose owners have not taken the same steps to upgrade their facilities. Their utility use is 10% less, they get 4.8% higher rents and 1 % greater occupancy, to cite a few advantages. For instance, retrofitting the aging iconic Empire State Building reportedly received a payback from its energy retrofits in less than four years-and can count on substantial net savings in the future. Government grants and other financial incentives take a lot of the pain out of funding the energy upgrades of older buildings. Preserving the past is both architecturally and emotionally satisfying to people. Eclectic cityscapes are valued for their cultural significance. The Federal Reserve did business in it for nearly six decades before it outgrew the building and moved to its Market Street facility. After a brief stint as a law firm, the old SF Fed was acquired by Bently Holdings, which converted its upper floors to LEED Platinum office space. Its lower floors are rented for elegant special events, business meetings and conferences. These spaces represent one of San Francisco’s greenest special event venues, as well as some of the West Coast’s most acclaimed spaces. The building is also included in the National Register of Historic Places and is and one of San Francisco’s significant cultural landmarks. Other such historic conversions abound throughout California. “We find that older buildings are usually better designed and detailed than most structures built in the last 50 years. Our job as preservation architects is to polish them up, make sensitive upgrades, and get them back into service. Oftentimes, the only way to save a building from demolition is to find a new use for it. Some buildings are easy to adaptively reuse-like hotels into apartments or warehouses into open office spaces. The biggest challenge is finding a compatible new use for unique building types, like the 1930s police facility called The Headquarters that we helped transform into retail and restaurants in downtown San Diego,” says David Marshall, president of Heritage Architecture & Planning. 72 Townsend in San Francisco makes use of a former single-story warehouse. Photo credit: Chelsea Olson, SB Architects.